We have mentioned elsewhere on this website that we always want our wedding photographs to have a timeless feel to them. We strive to produce images of brides and grooms that could have come from any moment in history. We see love as an eternal force that binds two people together for life. Our goal as DC wedding photographers is for the pictures that we create to convey that sense to the viewer. For that reason, we are suckers for a historic Washington, DC, wedding venue like the Andrew W. Mellon Auditorium. That the Mellon Auditorium is a beautiful part of the history of the Nation’s Capital is apparent from its location. The wedding venue occupies prime real estate on Constitution Avenue, a mere block from the National Mall. The Washington Monument is just a short walk away. So DC-area brides and grooms who want portraits with that iconic spire behind them can get them easily. They and their Washington, DC, wedding photographer need only duck out of the reception for a few moments. The Mellon Auditorium also sits next to the stately buildings that make up Washington’s Federal Triangle. As such, its external faces have the same ornate, majestic Classical Revival architecture as its neighbors. Like those edifices, this DC wedding venue has enormous columns as part of its street-facing facade. 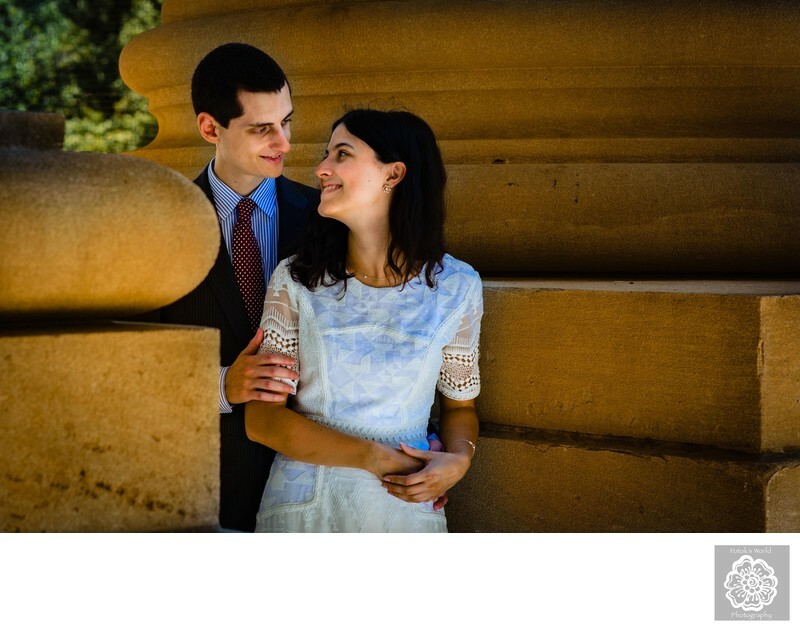 To us, they are a perfect setting for grand Washington, DC, wedding portraits with the couple nestled between the pillars. 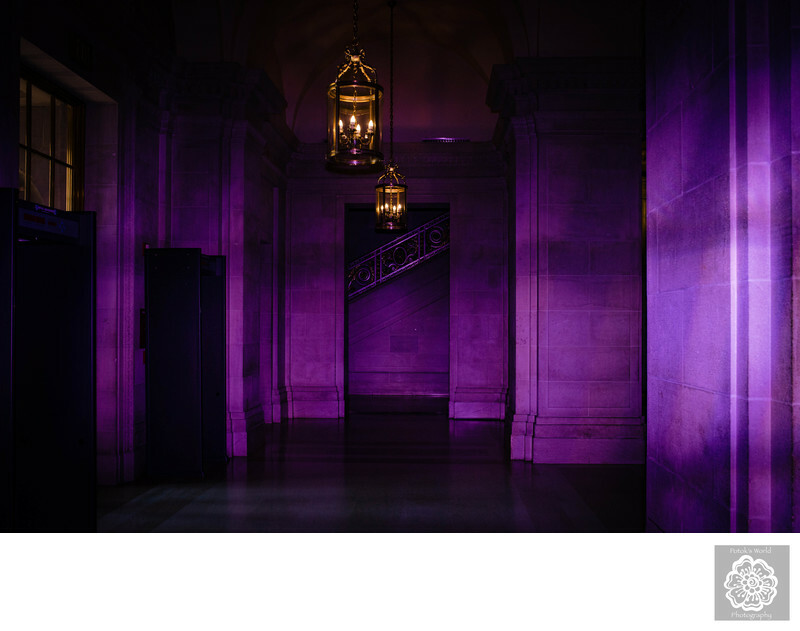 The inside of the Andrew W. Mellon Auditorium is equally suited to timeless wedding photography. We particularly love the main wedding and reception space: the Great Hall. 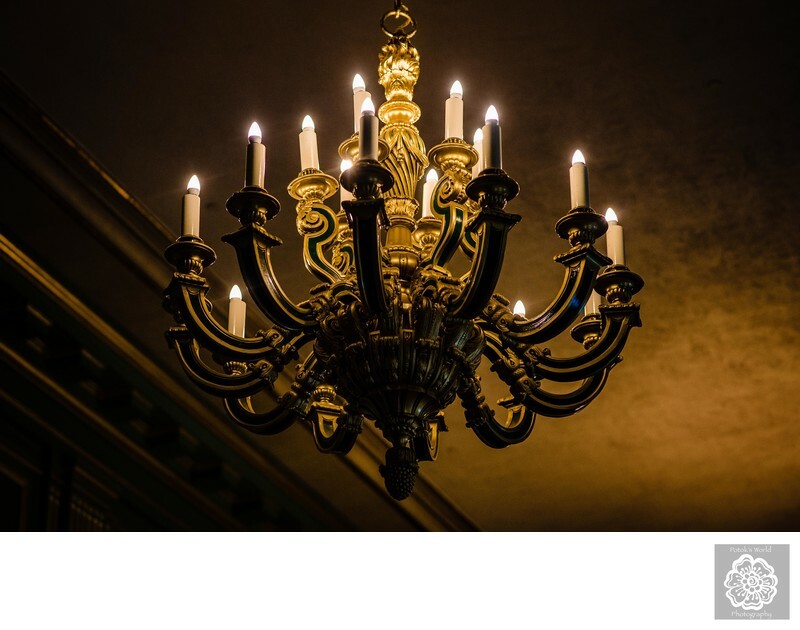 Like the exterior of the building, that main ballroom is both historic and majestic. Its stone walls and columns, coupled with its warm wood flooring, make it look like a grand ballroom from another era. It is also massive area that is an impressive background for awe-inspiring couples portraits. We especially like that the auditorium has a beautiful old balcony that overlooks the Great Hall. The ballroom is so large that photos from ground level do not always do its size justice. From up in the balcony, however, DC wedding photographers can capture images that show just how expansive the hall is. - Future spouses who love the idea of having their first dance as a married couple in a gorgeous grand ballroom. The grandeur of the Andrew W. Mellon Auditorium is evident well before you even step foot inside the front door. The first time that we saw its front entrance, we could already imagine how great newlyweds would look posed there. When viewed from the Smithsonian National Museum of American History across the street, the building towers above Constitution Avenue. The gorgeous 62.5-foot Indiana limestone columns in its facade dwarf the foot and car traffic below. Beneath the middle four columns are the building’s three main doorways. Each of those leads down to a set of stairs made from Deere Island pink granite. We envisioned a couple posing on the steps and framed inside the center doorway. The columns do such a great job of drawing the viewer’s eye down to the two people embracing below. Their distinctive architecture also gives the resulting portraits a typically “DC” look and feel! This wedding venue’s inside is no less ornate. 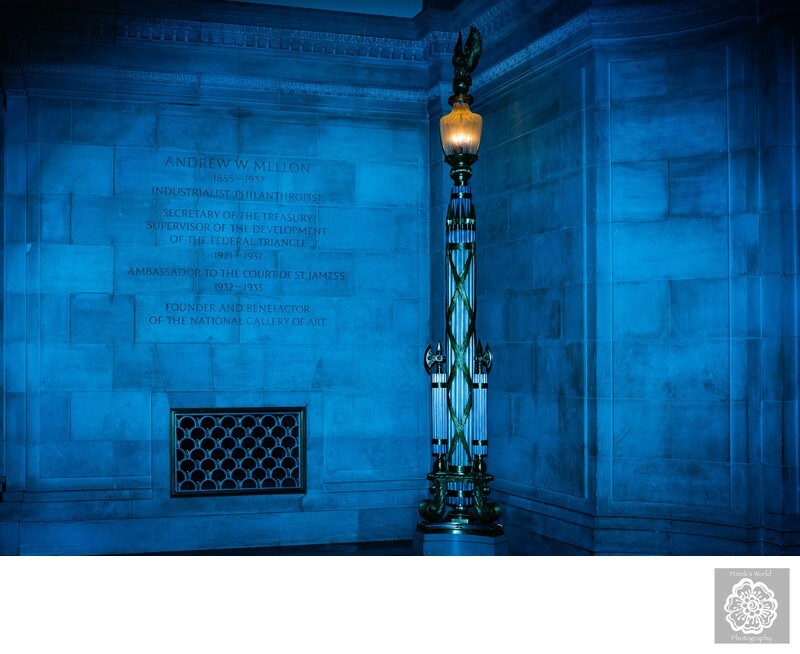 Immediately after you enter the front door, you are in the Mellon Auditorium’s stone lobby. 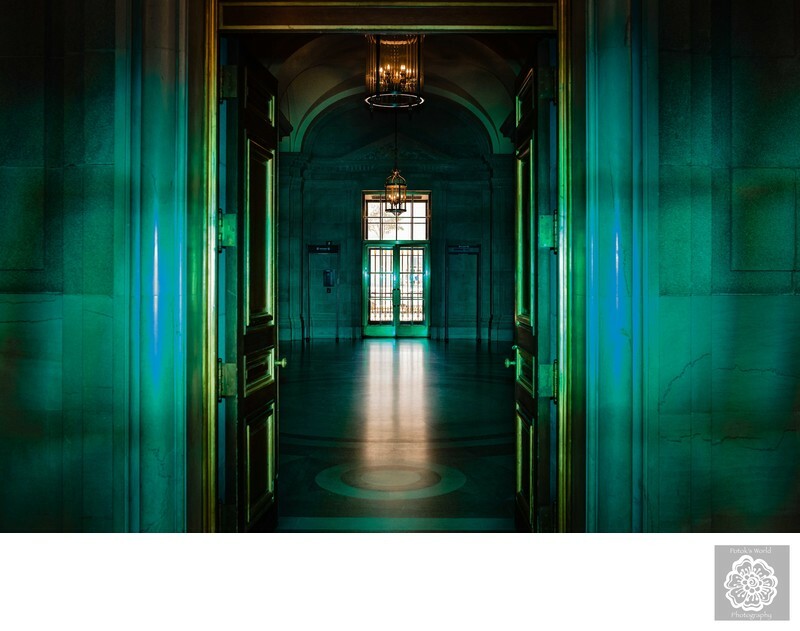 It is a stately and impressive introduction to the building’s magnificent interior design and decoration. The walls and square pillars are made from the Indiana limestone. The same material is used in iconic Washington landmarks like the Lincoln Memorial, the Pentagon and the Washington National Cathedral. The floors are made of marble — another common material in Washington architecture — and have beautiful gold, pink and red designs. Together, these elements make the entire space immediately recognizable as Washingtonian. The area is ideal for wedding receptions and is big enough accommodate up to 250 wedding guests. 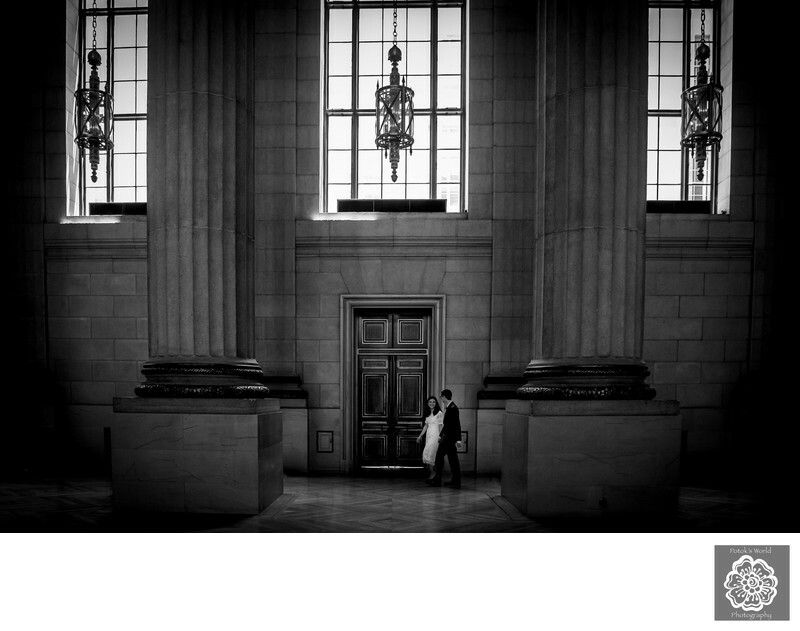 As DC wedding photographers, we love the Andrew W. Mellon Auditorium’s lobby as an ornate backdrop for beautiful portraiture. We particularly like that it can be a blank canvas upon which we can create them. By themselves, the walls and carvings make every wedding photograph look as though it were taken at a black-tie event. Their neutral colors, however, can easily be turned into something more colorful and fun with a bit of photographic creativity. In these image, for example, we put colored gels on our flashes to turn the walls different shades of the rainbow. Continuing straight through the lobby leads you to the crown jewel of this wedding venue: the Great Hall. Emerging from the darkened entrance and into the brightly sunlit ballroom area is a truly breathtaking experience. The entire room soars above you — the ceiling sits more more than 60 feet from the floor. It is illuminated by light coming in from long windows and defined by 12 fluted Doric columns rising above you. The latter are laid out in parallel rows on either side of the auditorium. These structures echo the aforementioned columns lining the Andrew W. Mellon Auditorium’s front entrance. They also remind you of other Washington buildings with this Doric architectural feature, like the Lincoln Memorial and the DC War Memorial. The columns make a great spot for couples portraits, because posing newlyweds at their bases gives the resulting images a sense of enormity and scale. Offsetting the coolness of the stone walls an columns is the Great Hall’s gorgeous floor. It is made of elegant polished oak that adds some lovely warmth to the room. The Great Hall can fit anywhere from 600 wedding guests seated at eight-person tables to 1000 attendees if they are standing. There is also a raised stage at the far end of the ballroom. It can serve as a space for an altar during a marriage ceremony. The stage is also a place where a wedding band or DJ can play music during the reception. In our opinion, though, the best part of Andrew W. Mellon Auditorium’s main wedding event space is the balcony. It offers great views of the floor below and the potential for unique photographs of the ceremony or dance floor. Brides and grooms can even get some beautiful couples portraits from above (if they are down on the main floor) or with a sweeping view of the auditorium behind them (if they are in the balcony). On either side of the stage in the Great Hall are doors that lead to three smaller, green rooms. These spaces are great for more intimate wedding celebrations or more exclusive gatherings during a larger nuptial event. 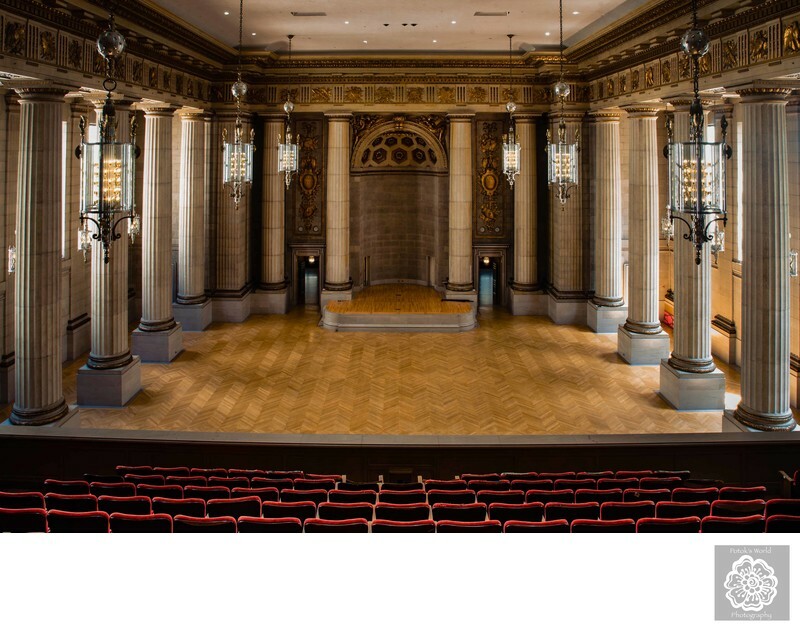 The general layout of these three rooms is symmetrical with respect to the exterior of the Andrew W. Mellon Auditorium. However, the West Green Room has slightly more interior square footage than its counterpart on the east side of the building. The former can accommodate 48-50 seated wedding guests,.The latter, on the other hand, can seat 36-40 attendees at three to five large round tables. Connecting the two side rooms is the considerably more spacious Center Green Room. That space can fit a minimum of 120 seated wedding guests and a maximum of 250 if they are standing. We love the way the three green rooms are decorated and the way that makes them look in pictures. The polished oak floors, exquisite electric-candle chandeliers and tall windows make the spaces look like halls in a European castle when photographed from wider angles. 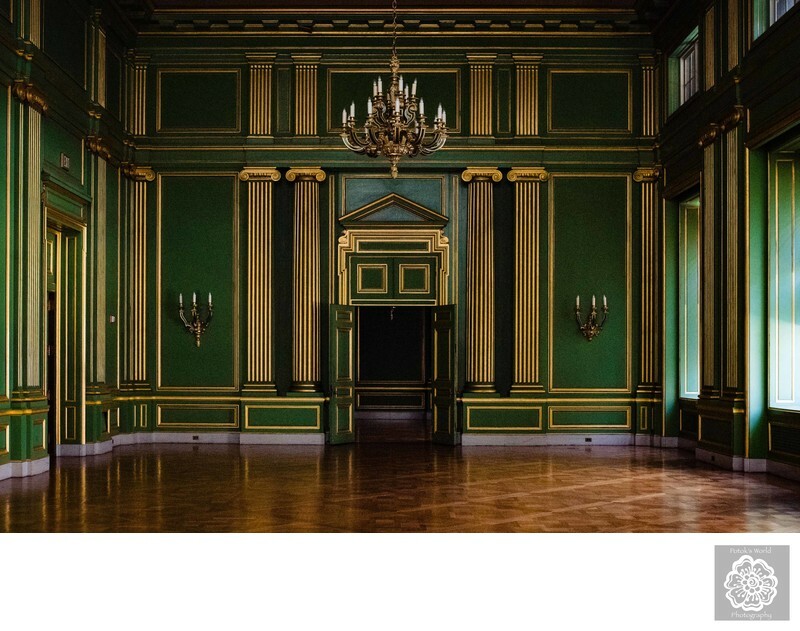 Because of its length, the Center Green Room looks like a dining room in which German, French or English nobility might have hosted elegant dinner parties in past centuries. The glazed green walls are also great for taking couples portraits from closer distances. The shiny finish and gold accents really make a stunning backdrop for portraiture. On either side of the wedding venue’s lobby are matching marble staircases that spiral upward in an unorthodox rectangular fashion. We always like to be able to take pictures of husbands and wives on stairs. Doing so allows us to capture images of them from more dramatic angles. We love that the shape of these staircases offer an even more unique take on this type of couples portrait. The rectangular lines frame the newlyweds in a completely differently than a traditional spiral staircase does. 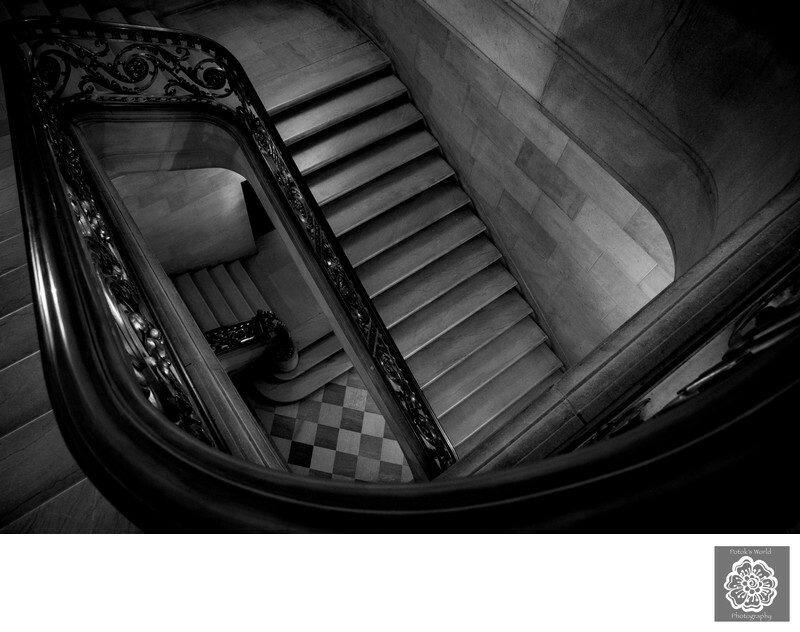 The stairs lead up to the third floor of the Andrew W. Mellon Auditorium. There brides and grooms can access the balcony that overlooks the Great Hall. That part of the building also has a lovely outdoor patio. Couples can use that space for wedding receptions with up to 200 people. 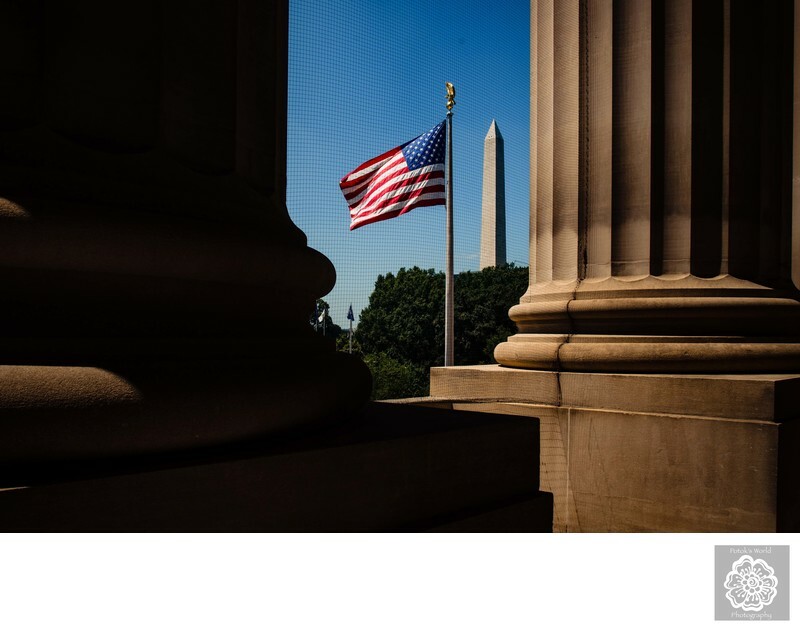 That area also has an expansive view of several of Washington’s most iconic landmarks,.. As one steps out onto the balcony, the field of vision is dominated by the facade of the Smithsonian National Museum of American History. That mammoth of a building occupies almost two of Washington’s city blocks. It makes a great (and very Washingtonian) background for any couples portraits taken on the patio. The really special views, however, can be found on either end of the balcony. On the east side, brides and grooms can get a nice view of the US Capitol through some of the Andrew W. Mellon Auditorium’s aforementioned stately exterior columns. From the other half of the space, couples can pose for breathtaking portraits with the Washington Monument and an American flag behind them. The verticality of these elements fits perfectly with the orientation of the columns, leading to very visually pleasing images. 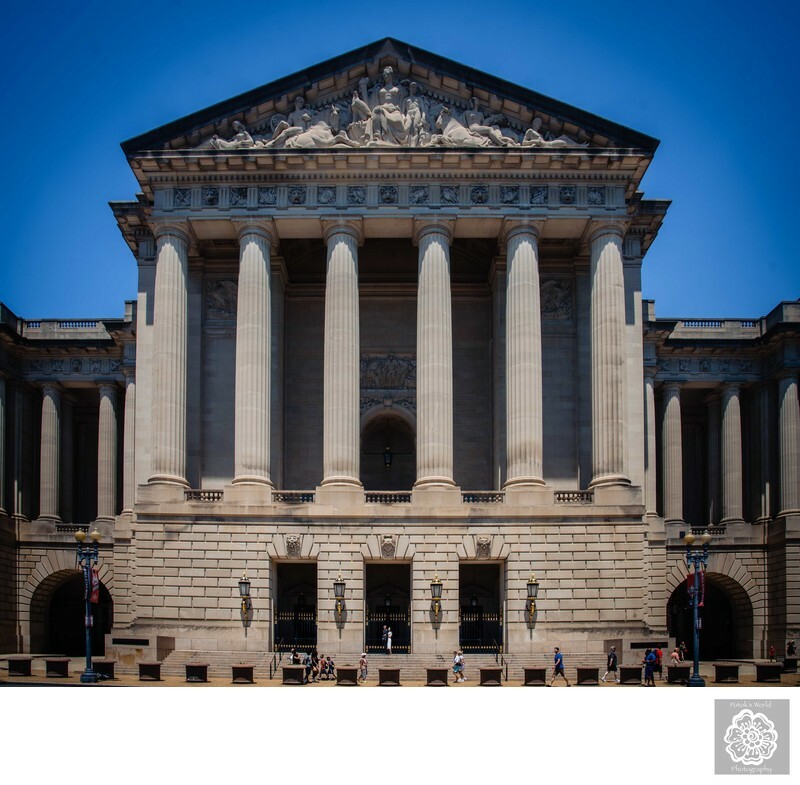 Disclaimer: The Andrew W. Mellon Auditorium would like to point out that any client shall have the right to photograph and record the exterior and interior of the AWMA, subject to EE/AWMA written approval. In no event shall the images be used for advertising, promotional or commercial purposes in such a way that it suggests that the United States Government endorses the activity. The client grants to EE/AWMA the right to photograph the event for the purpose of creating media for future marketing and promotional materials. Under no circumstances may interior or exterior graphic images of AWMA or its logo be used in promotional invitations or publications.